We plan to do the Gibb River Road with our dogs. Do you see many people travelling with a dog through the Gibb River Road area? I know our plan will have it's restrictions, ie national parks, but I understand there are still places to camp with dogs (we're campers through and through) and sights to see where dogs would be ok.
We are from SA but came to WA for a year - 3 years ago! (ok we got side tracked as we love it here.) Next June we will return to SA - via a drive around Oz. We have been doing a lot of research into travelling with dogs. For the most part we have found dog friendly parks instead of national parks to hike, places to stay that are dog friendly and kennels for the occasions we can't have our beloveds. (Ie, the kennel in Broome while we explore Cape Leveque). But we haven't found any info on the Gibb River Road. Do you have any thoughts or suggestions? Btw, I really LOVE your website and your inspirational story about how you came to live in WA. Thanks in advance for your advice - and for creating such a brilliant website. Update!!! This question and my original answer is from 2007! 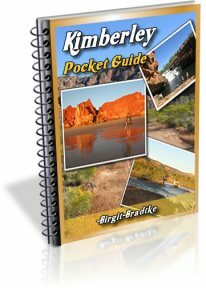 For current info on travelling the Kimberley and Gibb River Road with dogs see this page. Thanks for the kudos :-). Much appreciated. I'm glad you like the site. Most of the sites in Jan Holland's books allow pets. I can't recommend her books enough. (She also has books about southern WA and the NT.) If you don't already own them, get them. A must have for bush campers and will save you loads of money. Places you can't go on the Gibb River Road with a dog are the big sights, mainly Bell Gorge (conservation reserve managed by CALM), Mornington (wilderness sanctuary and conservation reserve) and the Mitchell Plateau (national park). Also check out Drysdale River Station on the Kalumburu Road. There are tracks leading to bush campsites on the banks of the Durack River, on both sides. Very nice waterholes, too. You may be able to camp at the Pentecost River crossing. (You're not supposed to.) The locals go fishing and camping there all the time (outside the tourist season...) and we take our dogs. Just make sure you keep the dogs away from the water!!! Crocs LOVE dogs. You can also take the Karunjie Rd/King River Rd from there to Wyndham. That's a really nice drive and has some camp sites and good fishing along the King River. Digger's Rest Station is in there, which is another great place that MAY allow dogs. You have to ask. Barnett River Gorge has beautiful bush camp sites. Jan Holland mentions a few more little clearings and sites along the Gibb River Road where you may get away with bush camping. As for all the stations along the way, you'd have to contact them individually to find out more. Hope that helps some. All the best to all you guys (two-and four-legged)! PS. 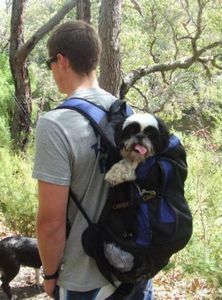 : A couple of days ago I had a similar question about camping with a dog on my Australian Outback site. It was a very general question so I couldn't help much, but if you can give tips and ideas from your research feel free to chime in. And last but not least, I and all travelling dog owners would love to hear about your experiences once you hit the road! I'm so glad to have found you! The information you have given me is gold, thank you. I have just hit ORDER on two of the books you recommended by Jan Holland too. Again, thank you! I am just so inspired by your story and your obvious passion for the Kimberly. I am really looking forward to getting up there and experiencing it. I love that there is someone like you up there prepared to help travelers prepare for their journey. Thank you for your advice on where we can't go, this is invaluable! I think we will do a day trip by air to Mitchell Plateau from Broome as that was the only heart breaker. My parents did this and apparently it's worth it. 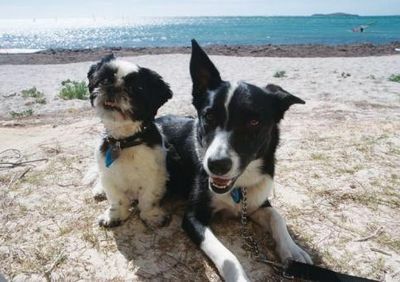 The dogs will already be in the Broome kennel for the few days we look at Cape Leveque which means only an extra day. Hello, I'm not sure if this question is appropriate for here... but I am desperate. We are moving to Broome and need to find somewhere for our precious puppies to stay while we wait for our company housing to be ready. Do you have any opinions or have you heard any stories about the kennels in Broome??? Your help would be very much appreciated. Maybe Jules, who started this thread, will respond to you as well :-). (I don't know if she elected to get notified of comments). I never take my dog travelling so I don't have first hand experience. Jules plans to leave her dogs in the Broome kennels for four days while she's on the Dampier Peninsula and at the Mitchell Falls. I had exchanged a few emails with her and I know that she's done a heck of a lot of research about everything. So I guess the kennels are ok. 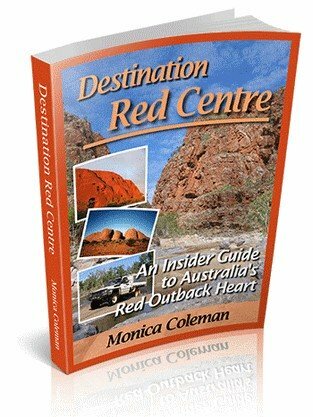 Check out the questions area on my Outback site as well. There is a dog question, too, and I answered with some links to books and resources. Maybe you can find the books in a bookshop (just to look up the Broome pages, not to buy it). You could also contact the Broome Visitor Centre and ask if they know of any other options but the kennels. Hope that helps some, and hope your company housing will be ready soon!! I now have information on kennels at Broome below. We are booked into the Broome Veterinary Hospital. My parents had their dogs stay there and thought it was very good - their 2 dogs shared a run which had access to inside and outside. They were walked twice a day. I would love to hear if anyone has information on the Broome Pet Motel. Costs per pet per day are: $16 for under 10kg's and $18 for over 10kg's. 25-40kg's is $17. If you provide your own food then you deduct $2 per dog per day. Cnr Cable Beach Rd & Frederick St.
We placed our beloved doggies here for 4 days - we were promised they would be walked & washed - in 18 months of travelling with them we have never seen them so upset - we don't think they had had any attention & they certainly had not been washed - we would not use them again. I saw the comment re the vet so I rang the pet motel and told them of my concerns. The competition actually relieved me and said she takes her pets there when they have problems and said I shouldn't be concerned. She did tell me she has room for my dogs and to view both facilities when we get to town. I thought it was good of the competition to vouch for the Broome vet... but will check out both just to be sure! Just wanted to update that I was really happy with the Broome Vet. I'd be comfortable using either business as I had interaction with both. The kennels were quite well sized with inside/outside runs and seemed really clean. Dogs are healthy so that's good. I did hear from one person that her dog got kennel cough from there but we were more than happy with this business. Hello, I am a Broome local and have several dogs. I have used both facilities and found both to be good, but I am a frequent user of the Broome pet motel as it is a family run business and while the faclilities may be not as flash and indoors as the vets is, they take extra care and attention to them. We have had our baby fall ill whilst in their care (due to a pre existing condition) and we can not reccommend more highly the care and speed of their attention to them at those times. They are very knowledgeable about dogs and always cook the dogs fresh meals everyday. They are slightly cheaper than the vets also. They are happy to do long term as I had mine in for 5 weeks when I first arrived till I found housing and they were more than happy for me to come and visit and take the dogs out daily. We drove to Broome and our dog flew ahead of us and stayed at the kennel at the vet's for 5 nights. We were really unhappy when we came to pick him up as the lady said they had no record of him - I thought my dog was not there and asked if he was there and she said he was, but then continued to take all our personal details before letting us see him. Our dog had lost a significant amount of weight and as soon as the staff member opened his area he ran away from us (which indicated that he hadn't been getting any exercise and just wanted to run around). It took a few hours to get him back to normal with us, and a few weeks to look like he did before arriving there. I really don't want to ever have to leave him there again and I will be looking into the Pet Motel for next time. Hi guys, I worked taking tours across the Gibb for a number of years. While I did not see many tourists taking dogs, all the locals would travel with their dogs. Best bet IMO would be to pull up away from the main areas/tourist stays. These pulls up an old problem, the use of 1080 (this from someone who has used it) is a bad practice. If you run into problems with anyone about where you are camping, I always say to them no one wants to let me camp there with my dogs. The guy at Diggers Rest is Roderick Woodland, I found my dealings with him to be all square so give him a call, alternatively camp in the gravel pits. A couple of spots I bushed camped in (few years back): Hahn River to the R after the river crossing. The Pentecost to the R before the river crossing. Barnett River Gorge (don't know that this is still open) (B's note: it's not), Adcock Gorge (B's note: ditto, no camping here). King River crossing King River Rd. Just watch for crocs. We travelled with our dog! We just came back from a trip up the Gibb River road and took our much loved dog Bonnie with us - cross between and black and tan Kelpie and Maltese (don't ask!) So she is very much like a miniature Kelpie - good natured - doesn't bark and used to spending time in car sleeping. We feel we didn't miss out on much and had a great time. It all depends on what type of dog you have I guess. We went to El Questro and had a private river camp and while we visited the gorge and springs, Bonnie stayed in the camper quite happily. At other places - Home Valley, Charnley, Wyndham, Derby, Manning Gorge, she was definitly welcomed as long as we had her on a lead. Charnley was the only one where we were not allowed to take her for a walk on a lead so that was a bit restricting. Manning Gorge is a must! We did a lot of bush camping so not a problem there. We went north of Broome to Quandong beach and camped and she had a great time up there. Caroline Springs 13km out of Halls Creek is a great spot to camp as well if you have a pet. If you are traveling down the centre and need a nights break from camping, call into the Desert view Motel at Coober Pedy, nice people and they even had an underground apartment with a courtyard fenced area for your dog. Amazing! We just did the Gibb River Road with our dogs and had a great time - El Questro, Home Valley, Ellenbrae, Drysdale River Station and Manning Gorge were all dog friendly and lots of free camps along the way were too. Just wanted to let you know that you can camp at the main camp ground at El Questro with your dog - they are very welcoming. You can't take them on any of the walks though. We saw a lot of dogs at the camp ground waiting patiently in the shade for their owners, and we actually took ours to the car park of Zebedee Gorge where we found a nice shady spot to leave them for an hour while we swam in the hot springs. It's important to keep in mind that after August the temps go up to over 35 degrees so it might be getting too hot for your pooch by then. Your site is a God send! Many Thanks. I will be travelling up there this year 2012, so I can keep you doggy people posted on current where our 4 legged friends are allowed to camp. Wouldn't have it any other way as I am a single female & it gives you a great sense of security & their company is the best. Thanks for all the info. Will be doing the GRR in late May/June and 'our boy' will be part of the travelling party. Would be great to meet up with other 'doggie' campers to share sitting duties, particularly to see the Mitchell plateau. Thanks all for your comments. We are heading up to the Kimberley's in June this year (2012) and still so undecided with our dog. She doesn't cope too well when we leave her for days/weeks. But she will quite happily sleep under the car/ caravan for a full day. We're traveling Australia and not sure if we want the expense/stress with a kennel or if we risk it and take her. We're hoping to leave our van near broome so we'll be doing a return trip. I just worry about our lil friend. We have travelled everywhere else in Australia with her though (had some restrictions but haven't missed anything). What about seeing mitchel falls and leaving a dog somewhere? Lots to think about and it's great to read about other peoples experiences and concerns. Would be great to find someone to watch our dog, while we watch theirs. But not sure if we can count on that. I'm very intersted in this thread. Me and my 2.5kg handbag sized best friend are heading off on the trip of a life time in a petrol Subaru outback (haven't got it yet but decided on this due to fuel prices). Just wanted to say thanks for your site and if anyone has done it and has great advice for me. This information is such a great help. 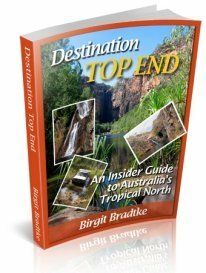 We are planning trip from north qld to wa, to mainly explore the Kimberleys, finishing the trip with a photo at Steep Point. We are travelling with two dogs. These threads are couple years old, was wondering if anyone could help me out with current camp spots along the Gibb River Road and where we can and cannot take the pups (what gorges etc). Cheers. Anonymous haven't travelled that way in years but heard they were becoming dog friendlier El Questro pets allowed at campsites not at attractions, Manning gorge last i heard was ok, sure there are others Home Valley maybe, the National parks no as usual in good old backwards Aus. Thought it was ok at Kalumbaru and probably at some of the stations easiest way to find out is call them and ask. This thread was great, thanks to all who contributed. 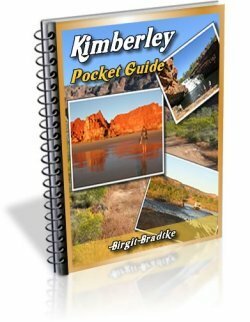 We are busy planning our trip leaving FNQ later this year and will be in the Kimberley this time next year. Like many dog owners leaving our furry family member behind wasn't an option! The feedback on here is very encouraging that we wont miss out on anything. Anonymous from 2 comments above, if anything has changed since this thread, we'd appreciate any updates! G'day! An update... We just finished the Gibb River Road! We also left from FNQ, on the Gibb we stayed at El Questro (had to leave dogs in camp ground while doing gorges - river to run them in), Home Valley (dogs allowed), Manning Gorge (very pet friendly, we scored a spot right on river all alone - just ask :) and can take them to the gorge as well! Our favourite place!) We didn't stay at any free camps only because we didn't want to risk one of them taking a bait (10:80) They are all along the Gibb just have to keep an eye out for signs and double check when checking in to camp grounds just in case. Other than that we just locked them in their crate on the back of the ute on the quick walk gorges with some water. They enjoyed it and so did we (even if we missed out on a few things). Wouldn't do the trip any differently! Hope this helps :) Happy planning! What's the first spot people camped with your dog from Derby? All of the stations in the threads seem to be about 300km from Derby. Doesn anybody know if there are boarding kennels in Kununurra or Wyndham? Many thanks for all the wonderful advice on traveling with a dog on the Gibb River Rd. We had planned to travel on the Gibb last year on our way across from Cape York & FNQ but our plans changed so we returned to WA via SA. We decided to put our Bichon in private care with a lovely couple out from Port Douglas rather than take him up the Cape. So glad we did as it was not the place for a small dog as far as we were concerned. Far too many pig dogs roaming around the streets. Our dog even though he would be on a lead it would be dangerous for him. Nice to think we could take him safely with care up the Gibb River. So looking forward to having him join us in April May 2017 on our trip. Many thanks for your wonderful site. So you can take dogs to Gibb River Road what spots can you go with your dogs?